It is noon on Holy Saturday. The large Holy Water container which stands in the back of the church by the confessionals is in the sanctuary. Father comes out into the sanctuary and blesses the water. People come forward and stand by the altar rail. One by one they hand Father glasses, jars, any kind of vessel which will carry a little bit of the newly blessed water. Father tells the people that they have now received the Easter Water. Lent is now over; they should go home now and have something to eat. This rite of blessing the Easter Water would have been typical in Roman Catholic churches about fifty-eight years ago. Where did this custom of blessing Easter Water on Holy Saturday come from? A benedictine scholar was entrusted with the task of researching the ancient rites of the Church surrounding baptism by Pope Pius XII. His work helped in the renewal of the Liturgy of the Church and to the revival of the ancient rites and practices surrounding initiation and baptism in the Church which we now know as R.C.I.A., the Rite of Christian Initiation of Adults. Lent is about baptism. Many Catholics when asked what Lent is all about may say that it is about giving things up, going to confession, and putting money into mite boxes and Operation Rice Bowl boxes, and not eating meat of Fridays. These things maybe popular Catholic images and collective memories of Lent, however, they are not what Lent is primarily about. They are a part of of Lent whose primary focus is baptism. The word “Lent” come from an ancient English word which means Springtime. A quick glance at what the word for this privileged time in the Christian year in other languages can help to flesh out our understanding of Lent. The word for this time of year in German is: “Fastenzeit” or Fast Time. In Spanish the word is: “Cuaresma”. This word is derived from the word “Quarenta” or Forty, referring to the length of this holy season as being forty days. The holy season of Lent used to begin Six Sundays before Easter. This was the day when the entire Christian community would assemble, the Lord’s Day and those who were chosen, the Elect would be presented to the bishop. The bishop would receive these Chosen Ones, those chosen to receive the Easter sacraments that year on this day. As time went on the Church pushed the beginning of the Holy Season of Lent back to the Wednesday prior to this Sunday so that the duration of this holy season would be forty days, in remembrance of the period of forty days spoken of in the Gospels when Christ was fasting in the desert and was tempted by the devil. In the second chapter of the Acts of the Apostles we read about the Pentecost event. 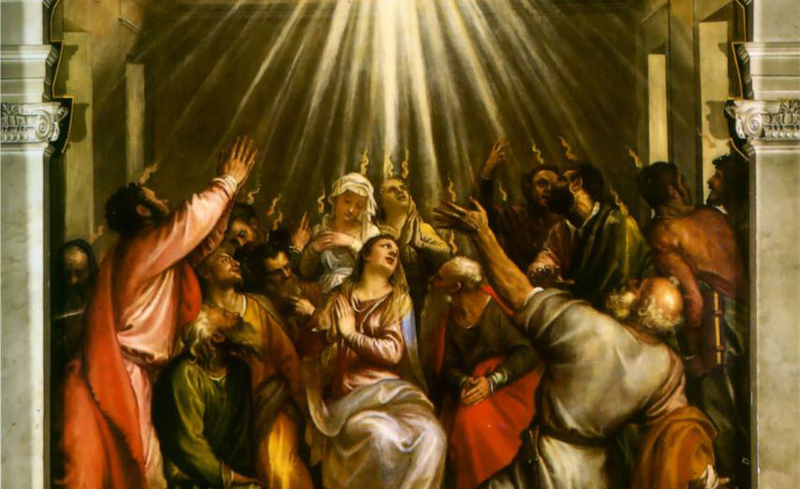 The Holy Spirit comes down upon St. Mary, the mother of Jesus, the apostles, and other disciples. The apostles are changed and strengthened. They open the doors of the place in which they were staying, go out into the street, and proclaim that Jesus, the crucified and risen One is Israel’s long awaited Messiah. St. Luke, the author of the Acts of the Apostles puts on the lips of St. Peter the words of the first Christian sermon. Some three thousand are baptized that day. (That’s a lot of baptismal certificates to fill out.) Understand that the community of believer in Jesus are expecting Jesus to return very soon; tomorrow or next week, at the latest. As time goes on and the message about Jesus spreads among Jews some non-Jews or Gentiles begin to hear the message and to believe. Some like the Roman centurion Cornelius and his household hear the message from the lips of St. Peter. The Holy Spirit comes down upon them and St. Peter orders that they be baptized. The growing number of Gentile believing in the message about Jesus and being baptized leads to a controversy in the growing but still fledgling community of believers in Jesus. The question was this; since the Messiah had come to the Jews would those who were not Jews have to become Jews, be circumcised, and observe the Jewish kosher laws in order to become followers of Jesus or not. Under that to accept circumcision carried with it not only religious significance but also nationalistic significance; one was not only becoming a member of the Jewish faith but was also becoming a Jew in nationality. 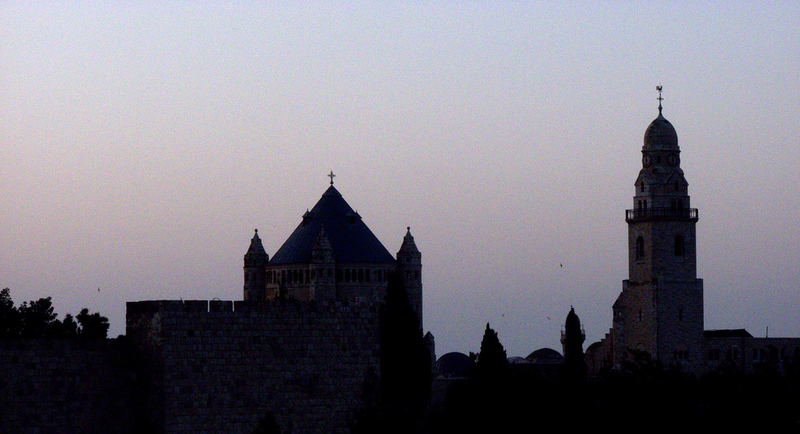 In the meeting of the apostles and the leaders of the Church in Jerusalem about the year 49 AD the Holy Spirit guided the leaders of the Church to realize that it was not necessary for someone who was not a Jew to have to become a Jew first before he could be initiated into the Community of the Believers in Jesus. The Church took off from this point. It launched out in its evangelical mission into the Greco-Roman pagan world to win that world for Christ. There was a new reality which the Christian missionaries encountered, however. The difference in preaching to pagans the message about Jesus, the Messiah as opposed to preaching this message to Jews is that when a Christian missionary said to a Jew that the longed for Messiah had come; he is Jesus of Nazareth, this statement would be an intelligible statement. When a Christian missionary were to say to a pagan that the longed for Messiah had come; he is Jesus of Nazareth. Jesus had been crucified and had risen, the response of the pagan would be, ‘What’s a Messiah?’. ‘He was crucified?! ; that’s too bad.’ ‘He rose from the dead? Yeah, right!’. (Acts 17:32). In other words, the Jews had the background of the Old Testament, they were expecting a Messiah. Whether or not they accepted Jesus as that Messiah was another matter. The pagans did not have that background; they had to be ‘caught up’, as it were so as to know what had gone before so that they could see how Jesus was the fulfillment of God’s promises. They needed some catechises. Thus, by the end of the first Christian century a system of instruction was in place in many places throughout the Roman Empire to show how God had dealt with and prepared his people for the Messiah. The Catechumenate was born. The word ‘catechumanate’ comes from two (2) Greek words: cata = according to or by and echo = the teaching, the tradition. A catachumen is one who listens from the doorway, who has one (1) foot over the threshold. What did the catechumenate look like in the early centuries of the Church? How did it function? The early Christians could not have instructions in the Faith for those interested in joining the Church on Sunday morning in between Masses in the Parish Family Center. First of all, there were no parish family centers. The Church was persecuted. From time to time the Roman authorities might take the Christians and put them in the arena with the lions and cheer for the lions, or they might stand you up against a wall in the archery yard and use you for target practice. Yet people did find their way to the Church and were baptized. How did they do it? Christianity offered two (2) advantages which paganism did not offer. It offered a morally ordered way of life and it offered hope for eternal life. In paganism who knew what, if anything came after this life. Therefore, eat, drink, and be merry because who knew what if anything came after this life. If you were interested in finding out about this Christian way of life you would find out who was a Christian. The Christian would have to be convinced of your sincerity in really finding out about this new life and that you were not interested in finding out where the local cell of Christians met so that you could bring the local Roman legion there and wipe out that cell of Christians. Once he was convinced of your sincerity he would bring you to a meeting of the local cell of Christians on Sunday. From the earliest days would meet on Sunday, the day of the Lord’s Resurrection, the day on which the Holy Spirit came down upon the disciples. They would meet in someone’s house or in a hall which they had access to. There would usually be a porter, someone who stood at the door and watched to see who was coming in. When he saw an unfamiliar face he would stop you and ask who you were and what did you want. The person who brought you would vouch for you and say, ‘It’s alright. He’s with me.’. Once inside you got to meet the Christian Community and you got to meet the leader of the Christian Community, the episeous,. The word ‘episeous’ comes from two Greek words; epi = over or on and seous = to watch, to see Therefore, episeous, the episcopus, the bishop. The bishop would scrutinize you and ask you, ‘Why do you want to become a Christian?’ and ‘What kind of a life are you leading?’ You would be allowed to stay and observe the Christian Community and to listen to their teachings. The Christian Community could also observe you. They would see if you were making progress in breaking with the ways of the pagan culture which were not compatible with the Gospel. Being a Christian was really living in a way that was counter cultural to the Greco-Roman pagan society in which you lived. For example; Christians did not go to the orgies, or go to the vomitoriums. They did not go to the gladiator contests to watch men fight each other to the death. Every red-blooded Roman boy wanted to a gladiator. Christians did not participate in emperor worship nor in the worship of the pagan gods. Christians worshiped only one (1) God; which seemed so contrary to the ‘wisdom’ of the society in which they lived. Becoming a Christian usually meant making a break with your family. The Christian Community wanted to see that if it came down to it would you lay down your life for your belief in Jesus. During this time a person in this situation was considered an inquirer. Eventually you would be asked if you would like to make a commitment to learning the Christian Faith and the Christian Way of Life with a view toward baptism. If all was agreeable you would be invited to inscribe your name in the Book of the Catechumenate. You were now recognized a someone who is seriously committed to learning about this new way of life with a view to being baptized. You knew that if this book fell into the wrong hands it could be your death warrant, however, it is truly the Book of Life. As a catechumen, you were recognized as a member of the Church but not a fully-initiated member of the Church. The catechumenate usually lasted for three (3) years, three (3) years and forty (40) days. The last forty days were a period of intense preparation, and prayer, and fasting, and study which developed into our holy season of Lent. While three (3) years was the usual time of preparation in the catechumenate it was not uncommon for a person to take a longer time to prepare for baptism. The person may want more time to see if they could agree totally with the teachings and/or the Christian Community wanted to be sure that the person seeking baptism would be committed to the Faith even to the point of laying down his life for it if it came to that. During this time of catechumenate the catechumen would come to the Mass of to the Lord’s Supper, however, they would only be allowed to stay for the first part of the Mass, which we know as the Liturgy of the Word, which used to be known as the Mass of the Catechumens. 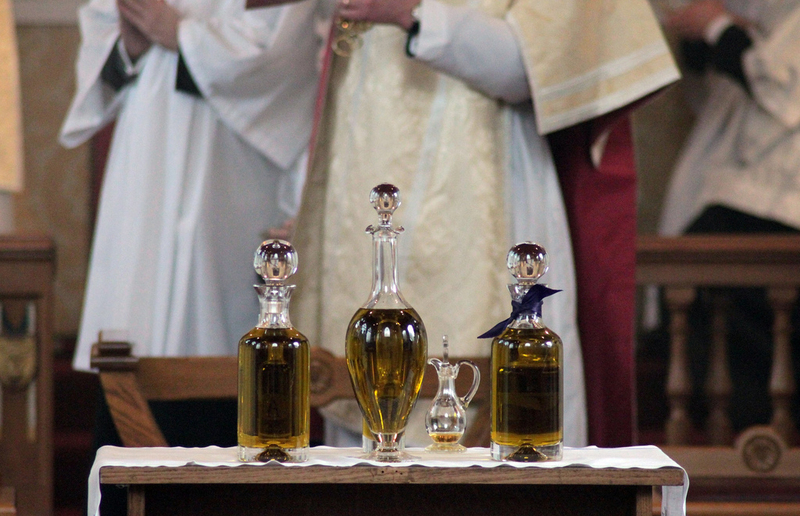 After the homily, the catechumens would be dismissed with prayers and anointings with the Oil of Catechumens. They would not be allowed to stay for the “Mysteries”, the Liturgy of the Eucharist or the Mass of the Faithful, as it used to be known as because they were not fully-initiated into the mysteries. They would be dismissed to go with their catechists, teachers to reflect on the Word which they heard. All during this time the person who first brought you to your first meeting of the Christian Community has not abandoned you. This person would walk the Journey of Faith with you, praying with you, accompanying you to instructions, sharing their journey into the Christian Faith with you; in short, becoming a spiritual Dutch uncle to you. Usually this person became your sponsor. As the time of your catechumenate was coming to an end and the Christian Community was convinced of your progress in not only learning the Faith but also living it you would be invited to progress onto the Order of the Elect. Elect means chosen. In the Rite of Election, the catechumen would inscribe his name in the Book of the Elect. Again, if this book fell into the wrong hands it could be your death warrant. However, as one signed the Book of the Elect, it was in a real sense signing one’s name in the Book of Life. The Elect would be received by the episcopus, the bishop. The people who were the Elect were chosen by God, and this choice was ratified by the Christian Community to receive the Easter Sacraments, the Sacraments of Initiation this Easter Vigil. The elect now entered into a period of intense preparation, and study, and fasting, and prayer which would culminate with their Baptism, Confirmation, and Reception of Eucharist at the Easter Vigil. However, not only the elect would enter into this time of preparation, their catechists, their sponsors, the leaders of the Church, indeed the whole Church would pray and fast with them. There were two (2) reasons for this; the faithful would pray and fast for those who were to be initiated at the Easter Vigil. Also, they recognized that they might become a little sloppy, a little temped in their commitment to living their Catholic Christian lives. This time of prayer and fasting was a time to exercise those spiritual muscles and become the leaner, kinder, Catholic Christians they professed to be to welcome these new comers into the Catholic Christian Community. This developed into our holy season of Lent.